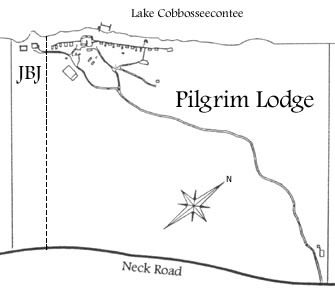 In late 1998 the Maine Conference began a campaign to purchase 14.9 acres adjacent to Pilgrim Lodge known as the JBJ Retreat. This plot of land was the small remaining part of Balbrook Lodge which was kept by the original owners when the larger plot was purchased by the Maine Conference in 1955. In March of 1999 this additional property was purchased by the Conference to expand and protect Pilgrim Lodge. This property has added 410 feet of waterfront, several buildings, and many more acres of woods to our nature trails. Another important part of this purchase was to absorb the right-of-way through Pilgrim Lodge linked to the JBJ property. Our first use of the one building on the new property was to house a significant part of our summer staff for the season. This opened up a former staff cabin for expanded nature education space.